From Manaoag, we proceeded to Vigan in Ilocos Sur. We travelled non-stop to Vigan, passing through the province of La Union. We just took note of the places we would stop by on the way back to Manila. Of note were the stores selling dried fish in all variants. We reached Vigan after sundown. We had difficulty looking for our hotel, The Cordillera Inn because of the different directions given to us by the people we asked. 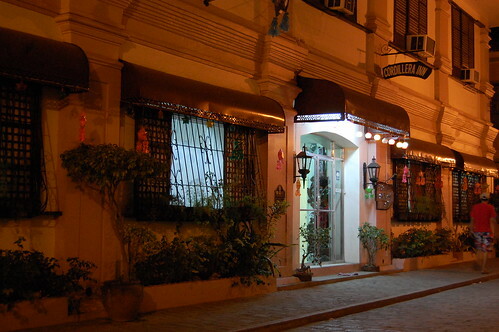 It turned out, much to our relief, that the hotel was at the center of the historic Calle Crisologo of the Heritage Village. Most of everything to see were just a few steps away. After checking in at the hotel we went out to have dinner as well as take a walk around the city. We passed by the Empanadaan, which is the place to get the famous Vigan Empanada. We didn't have our empanada at that time but once again we promise that we will try them before leaving the city. Our night tour of the city ended with a brief visit to the Vigan Cathedral. It was closed at that time but the place was well-lighted so I was able to get some photos again for record purposes. 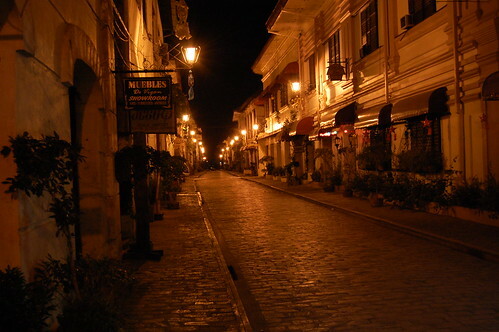 Before going to bed I took some more picture of the cobbled stone streets of old Vigan. With very few people in it, the street where our hotel stands took on a different personality. Looking at the pictures I took of the scene makes me wonder how it must have been before there was electricity and all the modern stuff we enjoy now. The following day, we went around the city to explore more of its beauty. I was also in Vigan last year but back then, the city was brimming with people and so it was crowded and a bit tiring to go around. This time however, it was almost as if Vigan was our alone to enjoy. Even though it was a Sunday, the area was not crowded, no noisy tourists to distract us in enjoying the scene. Sometimes though, we had to stay in the pavement to give way to the Calesas that provide tours at only 150 pesos. We went to the cathedral to hear mass, took our photos in front of the old houses and visited the Tourist Information Center. After all these, we finally had our Vigan Empanada for our midmorning snack. 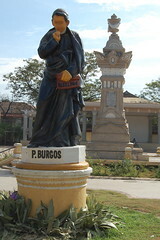 Just beside the place where we had our empanada was a monument dedicated to Padre Jose Burgos. He was one of the three martyred priests called GOMBURZA who were garroted by the Spaniards for being suspected of aiding the cause of the Filipino revolutionaries. Honestly, I didn't know he was Ilocano until now. Then we visited the Crisologo Museum, which was the ancestral house of a political clan in Ilocos Sur. 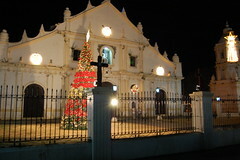 The house contained memorabilia from the family's political history, including the clothes worn by the patriarch who was gunned down by unknown assassins while inside the cathedral. We went to our next stop, a private zoo of a politician inthe province. The place is called Baluarte (Bulwark) and it is now open to the public. The main attraction in this place are the tigers, which were in cages at the entrance of the zoo. It was almost midday when we got there so the heat was intense. I was only able to get to the Butterfly Garden and then gave up. After this, we checked out of our hotel and drove to Ilocos Norte.